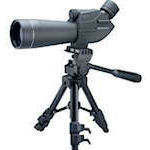 Eschenbach offers two spotting scopes - the Vektor and the Trophy. The 70mm Vektor features higher quality glass and coatings, but is best known for its variable angle eyepiece. The Trophy is more conventional - an angled 15-45x60 that is water- and fogproof, and comes with a table top tripod. The Eschenbach Trophy 15-45x60 spotting scope is a mid-sized scope in an angled configuration.This compact little scope weighs just over 2 lbs and is nitrogen purged to be fog- and waterproof. Trophy scopes are backed by Eschenbach's 10-year warranty. 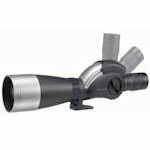 The Vektor S Zoom is Eschenbach's top spotting scope with multi-position capability and a 70-mm objective lens. Featuring a 20-60x zoom eyepiece, Eschenbach Vektor S Zoom scopes are backed by a 5-year warranty.